The intro is inspired by my first ever trip to Japan—an internship with a propeller company. I was taken along on a visit to Misawa Homes, one of the big prefab housing companies in Japan. (Of course the propeller company did business with a modular homes company.) I also got to see model homes in a yet-to-be-populated subdivision. It’s impressive stuff. The article is a bit heavy on the timing words, so I feel like I gave 場合 short shrift. It is the ultimate hypothetical word, one that can sit in for conditional verbs ending with たら or ば and one that doesn’t require you to perform any mental gymnastics with the verbs. 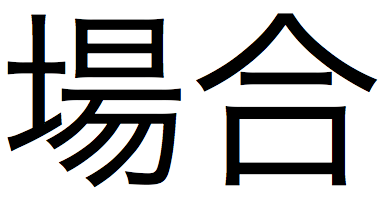 Not that it’s all that difficult to construct the たら or ば forms, but 場合 only really needs the past or present tense. I feel like I’ve tweeted out this Chiebukuro link before, but the pronunciation of 場合 is one of those few Japanese words that can vary a little. My first sensei pronounced it ばわい, which always stuck with me. I’ll use it every now and then.